I don’t know why you want to record a phone call, but I’m going to assume it’s for happy reasons. Today, I’m going to show you how to quickly and easily record phone calls on your Android using a simple app. Step 3) Check the box next to Record Calls and then go to your Media settings menu. 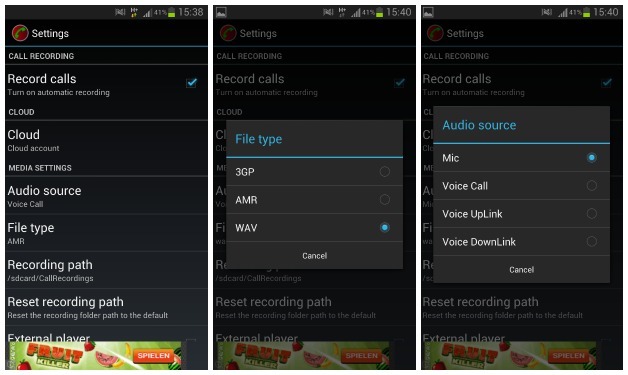 Change the recorded call file type to .WAV, which produces the highest-quality cell phone recordings. Finally, change your default Audio Source to Mic (most phones will already do this by default). Step 4) Test to make sure the app is working by calling someone. Look for a red recording dot under your phone’s notification shade to test if the recording is working. Once your phone call is complete, then you’ll receive a notification saying you have a New recording. You can tap that notification to perform all sorts of file-related functions, including Play, Delete, Share, Save, and Call Contact. Automatic Call Recorder isn’t the only Android app available to record phone calls, but it’s a pretty good one. I like that the recording capabilities are automatic, which means you’ll never forget to record an important phone call. It also gives you the option to save phone calls in the cloud. Alternative Method for Google Voice users. If you use Google Voice, there’s an extremely easy way to record phone calls. Google Voice only works through Gmail, but if you’re calling a contact on your Android phone, then you simply need to press 4 while the call is active in order to record the incoming call. Whether you’re recording threats from your ex-girlfriend for divorce proceedings or just remembering important doctor’s appointments, there are many good reasons to record a phone call on Android. Is it legal to record Android phone calls? Most other developed countries – including Canada, Australia, and Germany – have stricter privacy rules than the United States and require all parties to be informed of monitoring or else it is completely illegal. I know we get a lot of traffic from India, so it’s worth mentioning India’s recording laws: it is illegal to record telephone calls without approval by “a designated authority”, which means you’ll need permission from the government.